"I need... to speak to Caesar!" In case you've missed it, I've got the new TV spot and poster for DAWN OF THE PLANET OF THE APES. 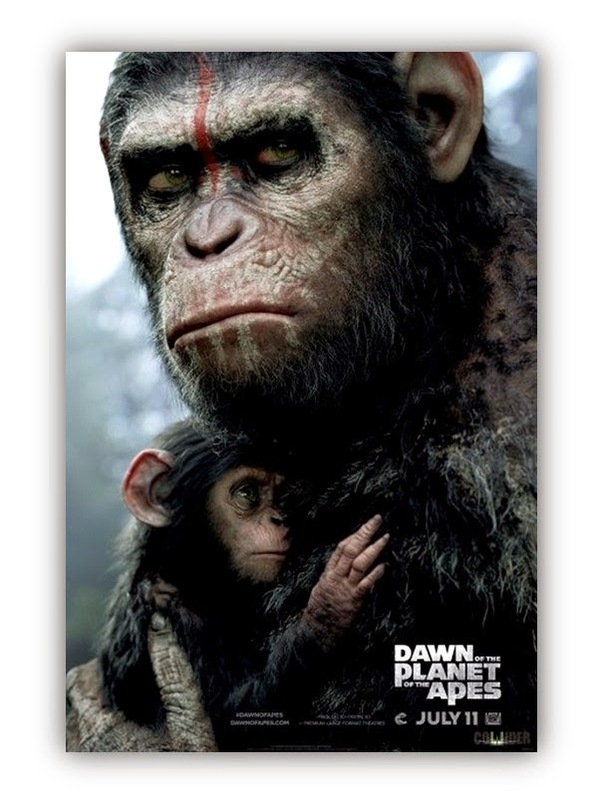 The poster is via our friends over at Collider and it looks quite emotional actually and that's an accomplishment given there are only chimps in the shot. The eyes ARE uncanny. The TV spot on the other hand shows just how far the scales have become unbalanced with the chimps and apes riding domesticated horses in clear military fashion. I can't tell if the spear points are made of stone or metal, but they are not solely wood. But are they limited to spears? Nope. A little further along and you can see one carrying an assault rifle - most likely acquired from a dead human. I'll say it again - the VFX looks staggering. Perfect from what I can see. Add in native 3D cinematography shot on industry leading 3ality Technica rigs and you've got a massive visual treat for the eyes. Bring it on Caesar! Speaking of Caesar, click here to read Tim's recent exclusive interview with man who performance captures him: Andy Serkis. DAWN OF THE PLANET OF THE APES opens on July11.